The tour lasts approximately 75 minutes. Ride the Ducks Branson has closed and is currently unknown if they will be reopening. Ride the Ducks Branson MO gives you the opportunity to see some of the most scenic views in and around Branson by land and by lake! 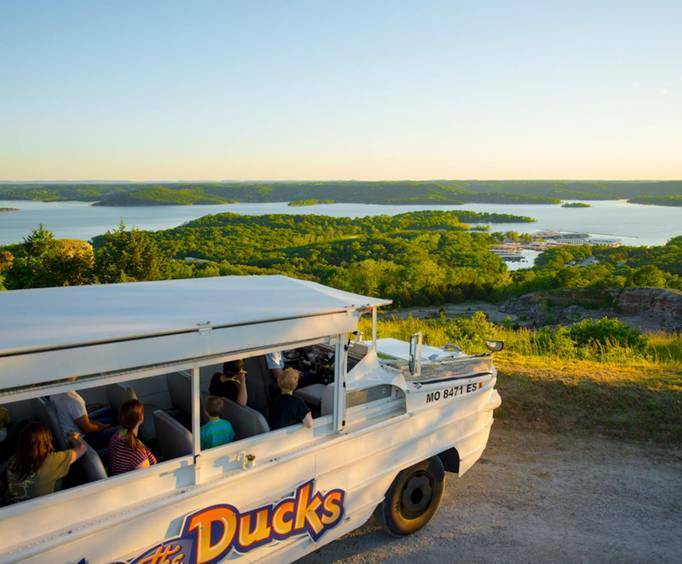 With either the Table Rock Lake tour or the Branson Landing tour, you're sure to have an exciting, quacktastic experience with these unique ducks! Your captain will fill you in on the juiciest details. And you won't have to worry, because every captain has a Captain's License from the United State Coast Guard. 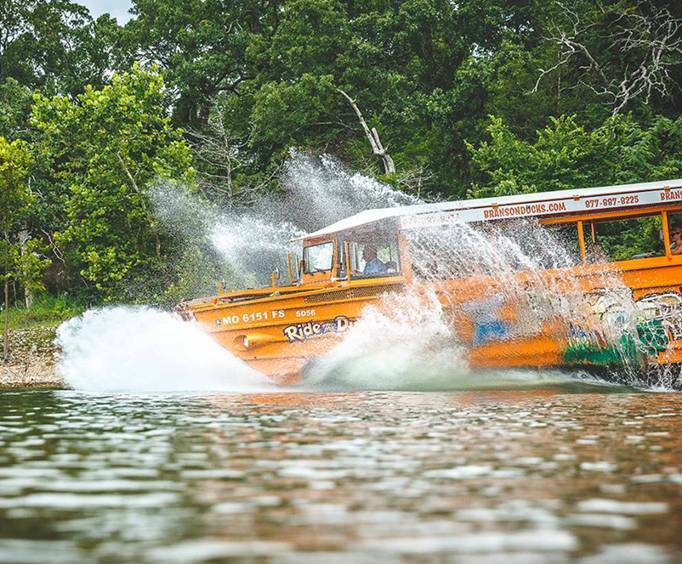 After your tour, you may even get the chance to drive the duck yourself once you hit the waters of the lake! 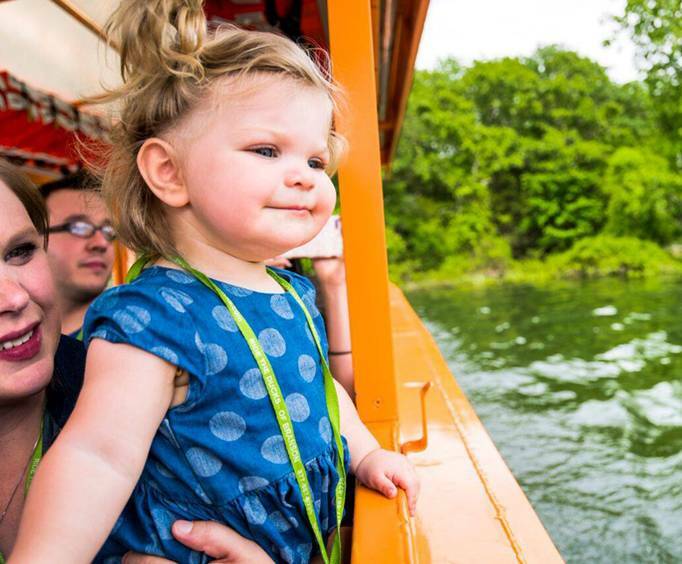 This is the best way to see Branson and is perfect for the whole family. You will not only have an incredible sightseeing experience, you will also learn about the history of Branson. The ducks are built resembling the WWII DUKW. The ducks use marine design for maximum safety and a regularly inspected and tested by the United States Coast Guard. in 2014, Ride the Ducks was awarded a 2014 Certificate of Excellence from TripAdvisor. The ducks are based off of the WWII DUKW by design only. the DUKWs were first established in 1942 by General Motors and were essentially a truck enclosed in a water-tight shell. This would allow the DUKWs to go into the water without being flooded. Each letter in the name stands for something. The D means it was designed in 1942, U stands for utility (for amphibious purposes), K stands for front-wheel drive, and W means two rear driving axels. The first known use of the DUKWs was in March 1943 when the United States landed Army troops in New Caledonia. In later times, the DUKWs were used to anchor ships to shore. The use of the DUKWs limited the number of casualties and were eventually made to carry 4.5-inch rockets. General Patton and General Eisenhower utilized the DUKWs to their utmost potential as a war tool and were continuously surprised at their abilities. This ride is awsome and so are the captains. My husband and i took both tours and loved both of them. The captains told jokes and let everyone drive the duck including kids. We will definitely bring the whole family next year. We enjoyed the ride the ducks. Getting our tickets were easy since we already had our confirmation. The guide was very friendly and kept our attention. Great fun! Had a blast! Highly recommend. Kids will love it also! "This was so much fun." This was so much fun. Our guide was hysterically funny, the scenery was beautiful. Going from land to water was great!